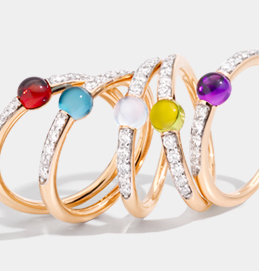 Iconic Pomellato jewels are colorful, rebellious, and unconventional. Founded in 1967, Maison Pomellato has come to represent masterful Italian craftsmanship, profound goldsmith savoir-faire, and jubilantly distinctive designs. Balancing the past with the future, tradition with innovation, rigor with experimentation, and sensuality with audacity, Pomellato design sets itself apart in the world of jewelry, as it has no equal. Every day in Pomellato’s Milan atelier, over 100 artisans craft one-of-a-kind jewels. Each gemstone creation is brought to life by their passion and expertise, forged by hours of meticulous labor and inventive solutions. This process brings together precious metals such as Pomellato’s signature rose gold, fine diamonds, and colored gems from all over the world. Synonymous with creativity and color, Pomellato was founded in Milan in 1967 by Pino Rabolini – the heir to his family’s goldsmith legacy. 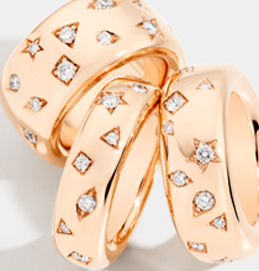 Introducing the prêt-à-porter philosophy to the traditionally conservative world of jewelry. Rabolini revolutionized women’s fashion choices while shaping Pomellato with a powerful, fashion-forward identity. Fifty years later, his jubilant, distinctive designs have grown to be revered both in Italy and across the international jewelry landscape. To capture the emotion of a jewel, instinct becomes an important guide. Inspirations are expressed within the jewel’s shapes – like perfect, tiny sculptures – each crafted by a combination of invention, curiosity and the Maison’s singular style. Free from convention, Pomellato pursues alternative solutions and perspectives in its jewels, rendering them tangible by the tactile and visual qualities of its authenticity. Amongst many expert techniques, Pomellato craftsmen most often employ microfusion. Also known as lost-wax casting, the process dates back to 3500 B.C., and allows the soft lines and voluminous, flowing shapes that the Maison has come to be known for. This goldsmith art is used to set increasingly rare semi-precious stones – known as the ‘new precious’ gems – to create jubilant, contemporary Pomellato jewels. 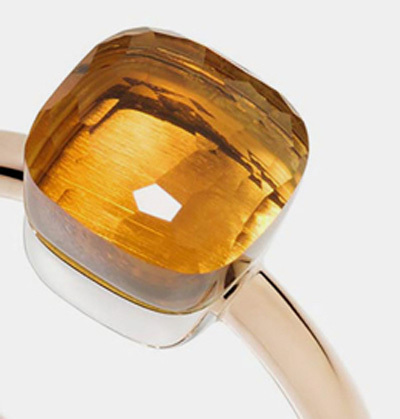 In-house goldsmith creation is an essential part of the Milanese brand’s identity and renown. Jewelry-making knowledge and experimentation involve rituals of painstaking care, and attention to materials.